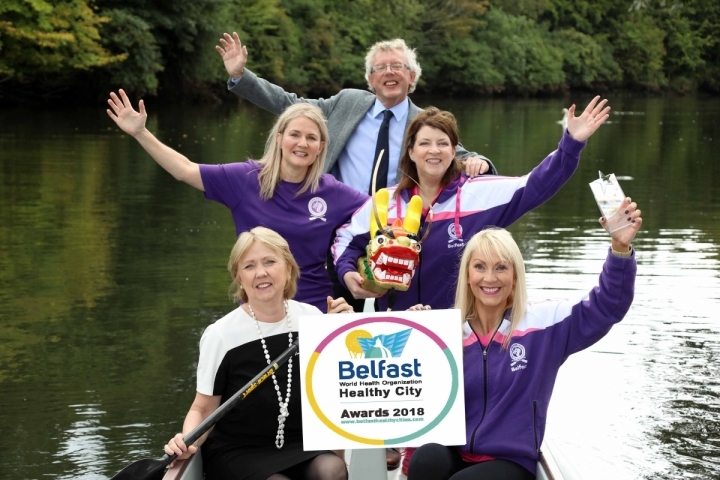 Joan Devlin, Chief Executive Belfast Healthy Cities; David Stewart, Chair Belfast Healthy Cities and members of Lagan Dragons Dragon Boat Club launch the awards. Following the significant interest in and success of the Belfast Healthy City Awards in 2017, we are delighted to announce the WHO Belfast Healthy City Awards 2018. This year awards will be presented in four categories in recognition of excellence in addressing a WHO Core theme during Phase VI (2014-2018). The awards will be presented at a high profile event that will be held on Tuesday 11 December 2018. Three finalists from each award category will be invited to attend. This award will highlight programmes and activities that aim to tackle inequalities in the city including addressing issues such as: socio-economic deprivation; fuel poverty; food poverty; the needs of vulnerable and marginalised groups; health promotion initiatives and tackling age or lifestyle related inequalities. Applications are encouraged from initiatives that demonstrate health equity is about creating conditions and providing services that enable people of all ages and backgrounds to fulfil their potential. This award will be presented to a programme or initiative that has significantly contributed to supporting good health through creating supportive and healthy places for people. Healthy Places focuses on how planning, transport and regeneration affect people’s lives, their health and wellbeing and how this shapes disadvantage and inequalities. Applications are encouraged from initiatives that aim to explore and demonstrate how ‘people’ oriented planning and design can contribute to health and equity, while also supporting the environment and the economy. This award will recognise achievement in healthy living; leisure and sporting activities including dance; active and healthy travel including cycling and walking initiatives; volunteering; and heritage and environmental programmes. Healthy living focuses on initiatives that encourage and enable people of all ages to live healthier lives and actively participate in society. Applications are encouraged from initiatives that explore and demonstrate how being physically and/or socially active contributes to healthy and cohesive communities as well as good individual mental and physical health and wellbeing. This award will focus on projects or initiatives that work directly with people to empower them to take control of improving their own health and wellbeing. Initiatives will demonstrate the application of active engagement processes to involve and retain participants. They will show how they make use of the assets that exist to improve health within the community and are likely to have involved collaboration or partnership approaches. Programmes could include those that encourage better understanding and use of health systems or increased self-management of conditions, as well as those, which support people to choose healthy lifestyles or improve their living conditions. Applications are also encouraged from initiatives that build capacity and improve leadership for health and wellbeing at a community level. Applications may be made by organisations from all sectors. Regional organisations are welcome to apply where they can demonstrate that activities directly benefited the people of Belfast. Nominated programmes and initiatives should be currently active, or have been completed within the past five years. The WHO Belfast Healthy Cities Awards 2018 awards will be presented on Tuesday 11 December 2018 at a high profile event in Belfast.